This page features items that have been discontinued, were used show pieces, bridal samples, etc. Each is pictured and described. Each piece has been repaired (if needed) and cleaned. Discounts range from 25-75% off retail prices! USPS First Class Shipping/Handling is included in the sale price! All Sales Final on these sales. Akoya Pearls were the first pearls to be cultured early in the 1920s, their white color and rosé overtone complement a fair complexion. 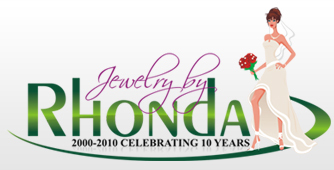 Akoya pearls are a high-quality pearl and you will find they are well matched for size, shape, and color. There are also few natural blemishes and they have a deep, beautiful luster. Read more about Akoya pearls. 17" hand-strung and knotted on silk approx. 5.5-6mm Akoya pearl necklace with 14k gold 11m x 6mm fishhook clasp. The pearls on this necklace have a deep rose undertone color with golden highlights This necklace retails for approx. $150+. 7" hand-strung and knotted on silk approx. 5.5-6mm Akoya pearl bracelet with 14k gold 11m x 6mm fishhook clasp. The pearls on this bracelet have a deep rose undertone color with golden highlights This bracelet retails for approx. $95+. 18" hand-strung and knotted on silk approx. 5.5-6mm Akoya pearl necklace with 14k gold 10mm round fishhook clasp. The pearls on this necklace have a deep rose undertone color with golden highlights This necklace retails for approx. $200+. 16" hand-strung and knotted on silk approx. 6mm Akoya pearl double-strand necklace with 14k gold 12mm round fishhook clasp. The pearls on this necklace have a lighter ivory color than the other 2 necklaces and bracelet pictured above with delicate rose undertones. This necklace retails for approx. $500+. Approx. 6mm 14k gold Akoya pearl earrings This pair of earrings retails for approx. $50+. Rare and unusual. 14k gold earrings featuring approx. 9mm black and 8mm white Akoya pearls. This pair of earrings retails for approx. $150+. This sterling silver freshwater pearl set is in a swirl design with accent cubic zirconia stones. How pretty and feminine! This jewelry set will definitely get compliments! This 3-piece set (necklace, bracelet and earrings) features pink pearls and flowers - so sweet! The necklace is a choker - there are 5 strands of 3mm genuine cultured pink (with hints of peach and mauve colors) pearls spanning almost 12". There is a sterling silver bar and lobster clasp that adds an additional 1", for a total choker length of 13". There is a 2 1/2" sterling silver chain extender - giving the necklace a total length of 15 1/2". Between each pearl is a silver foil seed bead. There is a gorgeous 1 1/2" frosted glass flower focal point in the center of this necklace with a 7mm matching pearl as the center of the flower - sure to get noticed! The matching bracelet has 5 strands of genuine cultured freshwater pink pearls and silver foil seed beads (just like the necklace). The pearls and beads span 5" with a sterling silver bar and lobster clasp that add an additional 1", giving a length of just a little over 6". There is a sterling silver chain extender that adds another 2 1/2" - so this bracelet has a total length of 8 1/2". The matching earrings are on sterling silver Leverbacks. There is a matching approx. 8mm teardrop genuine cultured freshwater pearl dangling from each Leverback. The earrings dangle approx. 1". 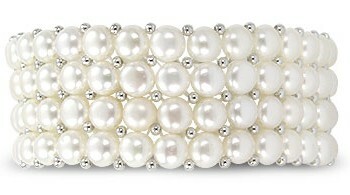 This is a 7/8" wide genuine cultured freshwater pearl bracelet. There are 4 strands of approx. 5mm round button-shaped pearls with 2mm sterling silver accent beads. This bracelet is made on "stretchy" cord (no clasp) - very clean look. It should fit the average-sized wrist (approx. 7-8"). This is the matching a 11/16" wide genuine cultured freshwater pearl ring. There are 4 strands of approx. 5mm round button-shaped pearls with 2mm sterling silver accent beads. This ring is also made on "stretchy" cord (no clasp) - very clean look. It should fit approx. 6-8 ring size. These necklaces are "station" (could also be called "tin-cup") style made on nylon-coated stainless steel wire. Each necklace is approx. 16 1/2" long with a sterling silver clasp and approx. 2" sterling silver extension chain. The pearl are somewhat irregular in shape and size, some blemishes, but so pretty for the price - they range in size from 9x7mm to 11x9mm. Each 2-piece necklace and earrings jewelry set is made with approx. 5mm genuine freshwater pearls and Czech fire polished crystals. Each necklace is approx. 16" long with a 2" extender. The matching earrings dangle approx. 1 1/2" (white pearl) and 1" (black pearl). Each one of these sterling silver necklaces feature black and red faceted 6mm beads and freshwater pearls. Each necklace is approx. 16" long (the black onyx necklace has a 2" extender, the red onyx necklace has a toggle clasp). This necklace is best worn as a choker - there is no clasp, just the coil material the necklace is made of. The black beads are black tiger-eye beads - approx. 10mm x 5mm with freshwater pearls and sterling silver bead accents. The total length of the necklace is approx. 12" - a nice choker size.